Last week, Agriculture Secretary Thomas Vilsack announced rules that would de-regulate a genetically modified (GMO) variety of alfalfa. This decision disappointed advocates for organic agriculture, because there are legitimate concerns that the new variety will sometimes spread to the fields of organic alfalfa farmers, who are not supposed to use GMO varieties. Earlier, Vilsack had made some effort to explore a co-existence policy, which would permit GMO alfalfa, but with restrictions to ensure that it does not contaminate the fields of other farmers. In the end, bowing to intense pressure from agricultural technology companies and major farm interests, USDA mostly skipped the co-existence idea and opted instead for what amounts to outright de-regulation. Different regulatory agencies in different countries may react differently to the possibility of an occasional GMO plant in organic fields. In the United States, although this possibility may not put organic farmers in much jeopardy of losing their certification, most organic farmers and organic-friendly food companies are upset by the USDA decision. In this circumstance, it was surprising to read the ferocious attacks on big-business organic companies -- such as Whole Foods and Stonyfield Yogurt -- in a recent column by Ronnie Cummins of the Organic Consumers Association. Cummins was angry that these big-business organic companies had written favorably about "co-existence" while lobbying Vilsack and USDA. Cummins felt these companies should have advocated more whole-heartedly for even stricter regulations against GMOs, not co-existence. Cummins' column is strangely defeatist. 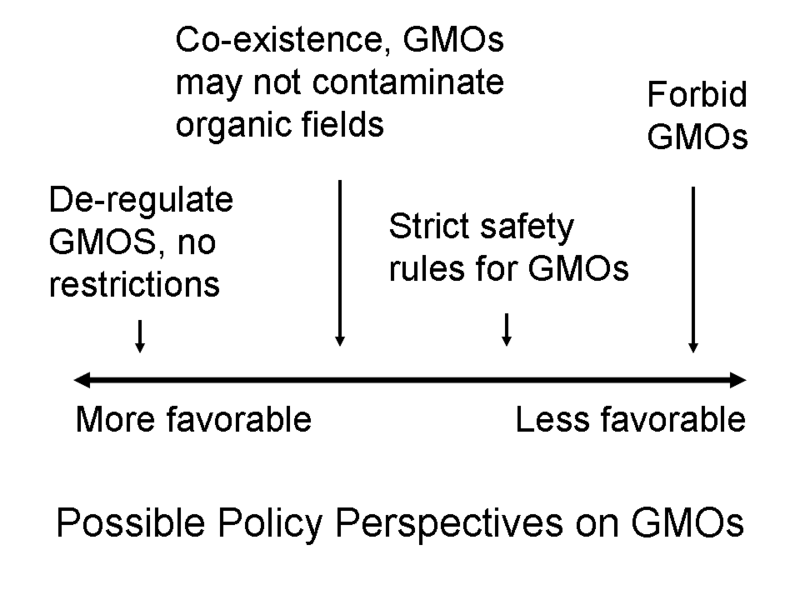 When USDA is deliberating between two policies -- outright de-regulation or "co-existence" (the first two policies on the left in the figure below) -- it seems more sound for organic consumers to think of "co-existence" advocates as relatively favorable to organic agriculture. 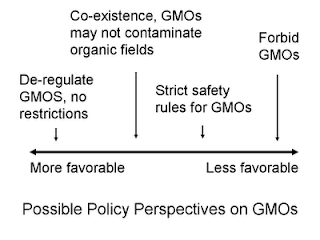 Later, if a policy argument arises between co-existence and stricter rules against GMOs (further to the right in the illustration), that would be the right time for Cummins to argue with Whole Foods and Stonyfield. My interest in this debate goes beyond organic alfalfa. The general principle, in any argument over incremental policy change, is that one should generally be thankful for any support that helps in putting together a winning coalition. Update (March 4, 2011): First, after a friendly grilling from wise people, let me retreat a little from the broad tone of the post's final paragraph. I do still suspect that strong GMO critics picked the wrong moment to seek an intramural fight with business-friendly GMO critics in this case, but it is not more generally always true that strong advocates on any moral or social issue are obliged to be thankful for support from moderates. There are very good occasions to be impatient with moderates (see King's Letter from a Birmingham Jail). I shouldn't have drawn such a broad conclusion. Second, on a more upbeat note, further fascinating discussion of this debate has continued at NPR, Huffington Post, and the Friedman School's student-run online periodical Sprout. The nonpartisan Government Accountability Office this week recommended that the Food and Drug Administration take steps to clear up consumer confusion about health claims that food companies make on their products. health claims -- aka REAL health claims -- which must have evidence that meets a standard called "significant scientific agreement"
Food manufacturers only use a few major officially recognized health claims, because, truthfully, there is not a lot of good evidence for many of the claims that companies might want to make. FDA was forced several years ago to allow qualified health claims, because companies had sued in court over their First Amendment rights to make claims that had some scientific evidence, even if there was not enough to count as Significant Scientific Agreement. However, the necessary cautionary statements about weak evidence are a turnoff for the consumer, so manufacturers have not made major use of these qualified health claims. As a consequence, manufacturers have placed most of their bets on structure / function claims, which do not have to be backed by much evidence, because these claims pretend not to be health claims in the first place. The only time FDA can take action against a structure / function claim is if it is blatantly false or misleading. The most striking thing about the new GAO report is that it recommends FDA strengthen its ability to find out if such claims are false or misleading. GAO points out that the Federal Trade Commission, which regulates advertising, has the authority to ask companies to present evidence for their claims. FTC officials told GAO that they would be unable to enforce the rules without this authority to ask for evidence. However, FDA lacks the authority to make companies share their evidence. GAO recommended that FDA identify and request from Congress the authority it would need to effectively judge whether structure / function claims are false or misleading. I am curious what Alex Tabarrok would say about this GAO recommendation. Alex is a widely read economist blogger at Marginal Revolution, who tends to be ferociously (and thoughtfully and provocatively) critical of FDA on other regulatory issues.